Could this be the year WSU men’s basketball finally turns things around? Ernie Kent thinks so. The Cougars lost point guard Malachi Flynn - who transferred to San Diego State - but they've reloaded with a host of junior college transfers and Ernie Kent says he believes they're about to turn the corner. 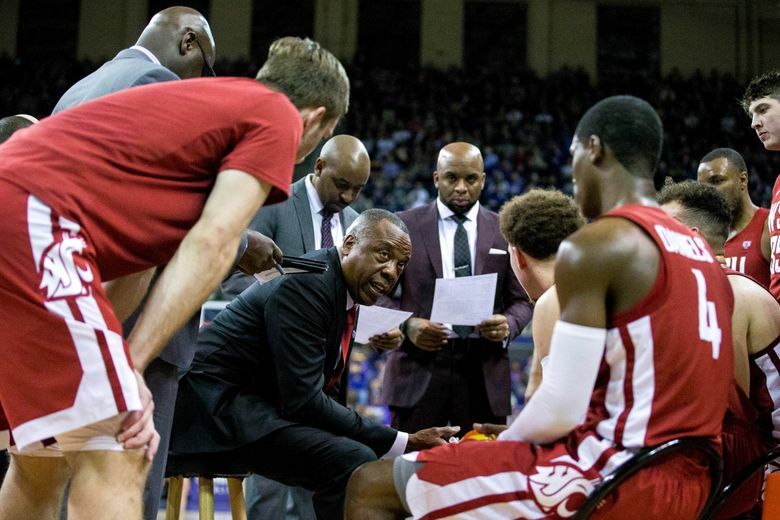 PULLMAN — Any doubt about the mindset or resolve of Washington State men’s basketball coach Ernie Kent after four consecutive losing seasons evaporates the minute Kent starts talking about his team. His excitement and determination are visible. No matter that his Cougars are picked to finish last in the Pac-12. He feels the turnaround is coming – and soon. He thought it was happening last year, when the team started 6-0 and won the Wooden Legacy tournament against some very good teams. But “we came back here, and didn’t handle ourselves well, and got knocked out of whack and never got it back,” said Kent, whose team finished 12-19. But this is a different team, Kent said, and he can’t wait to show it off. “I can’t put it into words,” Kent said of his excitement level. “You go through this, and you struggle with the program, and build it and put it together – and you finally feel like you are getting there, where you can compete with the other teams in terms of player personnel. Indeed, there are reasons for optimism, beginning with the return of Robert Franks. The 6-foot-9 forward declared for the NBA draft, but pulled his name out one day before the June 1 deadline, deciding to return to WSU. Franks led the Cougars in scoring last season at 17.4 points a game (seventh in the Pac-12), was second in rebounding and was named the Pac-12’s most improved player. Three of the team’s top four scorers from last season are back, with the notable exception being point guard Malachi Flynn, the starter at that position the past two years and the second-leading scorer last season at 15.8 points a game. Flynn transferred to San Diego State, leaving Kent a big hole to fill. He said he believes he has done that, bringing in two junior college stars: 6-foot-2 Jervae Robinson from Colorado and the speedy 5-11 Ahmed Ali, a second-team junior college all-American at Eastern Florida State College who once scored 103 points in a high school game in Canada. Kent said the two “are in a ferocious battle” for the starting spot, but both will see plenty of playing time. “They are different and unique,” Kent said. “One is strong and can get in the lane and score (Robinson) and can shoot the three. The other one (Ali) is super quick and can defend full court and can shoot the three. The two of them together give us kind of a two-headed monster that we have not had before. Joining Franks as key returners are shooting guards Viont’e Daniels and Carter Skaggs. Daniels, a 6-2 senior from Federal Way, shot 45. 5 percent from three-point range last season (71 of 156) and was third on the team in scoring at 9.1 points a game. Skaggs, a 6-5 junior, averaged 8.2 points per game, fourth on the team, and shot 40 percent from three-point range (69 of 171). What also has Kent optimistic are new front-line players, including a pair of freshman forwards: CJ Elleby, 6-6, from Seattle’s Cleveland High School, and Aljaz Kunc, 6-8, from Slovenia. Also expected to be contributors from junior colleges are 6-10 James Streeter and 6-7 Isaiah Wade. Kent talked about the time it takes to build a program. In his sixth year at Saint Mary’s, he finally turned the Gaels around and got them into the NCAA tournament in 1996-97. Then, his Oregon team took a huge leap in his fifth season, making it to the NCAA tournament Elite Eight in 2001-02. He said this is the team to do that.